If you’re looking for the best outdoor projector for the big game or just an evening outside with the family, an HD, high lumen projector is probably the right choice for you. We spent about two weeks outside, testing various projectors in different lighting, cloud cover and backdrops. We made sure that prior to giving a recommendation we had the best possible knowledge so you can be safe in knowing you’ll be getting a quality project that functions just the way you need it to. All of our top choices were excellent, but when it came down to it, the ViewSonic PJD7720HD 3200 Lumens 1080p HDMI Home Theater Projector is the best outdoor projector for most people. Its extremely bright image, HD display and long bulb life make it an excellent value for its price and an incredible addition to any outdoor entertainment system. The ViewSonic PJD7720HD is a incredible full 1080p HD, 3,200 lumen projector capable of bright, crystal clear images in even ambient light conditions, perfect for any outdoor entertainment. 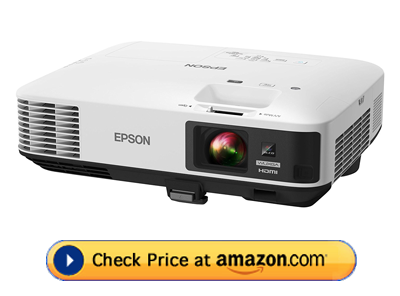 The Epson EX9200 Pro WUXGA 3LCD Projector Pro is also an excellent choice for an outdoor projector with its ultra bright 3LCD display technology and wireless capabilities. Plus with the same 3,200 lumens as our top pick you can be sure you’ll have a great picture even before the lights are out. When it comes to a backyard projector your always fighting against natural and artificial light, but with the Epson EX9200’s 3LCD display you’ll have enhanced images and colors compared to more traditional DLP projectors, even under less than ideal conditions. The built in speaker and wireless capabilities means this is a complete solution when it comes to outside entertainment. Plus, the Epson is very easy to set up and has multiple adjustments so you can get the picture just right. The 1080p resolution of this unit makes even the largest of images seem crystal clear and the 10,000 hour life bulb means very infrequent replacements, saving quite a lot of money in the long term. With the included HDMI connection, common among mid and top range projectors, you’ll be able to transfer high bit rate video and audio though a single cable meaning excellent video quality and stellar audio. The Optoma EH500 is a high power outdoor projector that has a whopping 4,700 lumens to produce ultra bright images in even well-lit conditions. After dark, you would have trouble telling that you aren’t in a movie theater. If your looking for the best outdoor projector that is a more high-end unit this would be an excellent choice. With the extra brightness and powerful lamp you will be enjoying crystal clear and amazingly bright movies before the competition is even done setting up. Plus with full 3D compatibility you can watch the latest in 3D entertainment from the comfort of your own backyard. The 10,000:1 contrast ratio will help the blacks seem blacker and the whites pop right out of the screen. In additional the DLP BrilliantColor technology will give you vibrant colors that are produced accurately and true to the originals. Lastly the rapid shutdown feature ensures little downtime when it comes to moving the projector inside after a long night out and helps to reduce overall energy costs. This article is here to give you a a great knowledge base when it comes to choosing the best outdoor projector. Whether your an outdoor grill master who likes to watch the big game or you’re looking for a relaxing evening by the fire pit with a classic movie. 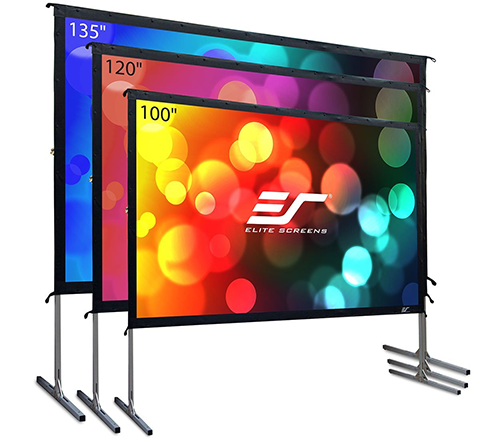 When it comes to higher dollar purchases like outdoor projectors you’ll what to know everything there is before placing an order. In the next few sections we’ll go over all the necessary details, specifications and recommendations so you can have all the information to make the right choice. We’ll show you what features to look for, how many lumens are ideal for an outdoor setting and what sort or connection you’ll want your new projector to have. In the end, we simply want you to get the most enjoyment and best value for your money when you finally decided on the right projector for your backyard paradise. There are seven main items you have to be aware of when buying an outdoor projector. In the below sections we’ll cover these one by one, but keep in mind that Brightness and Resolution are the most critical items you need to pay attention to when looking for a projector. High brightness allows you see the screen even under non-ideal lighting conditions, while a high resolution keeps the image crisp and clear when projecting a larger screen size. When it comes to choosing the best outdoor projector you’ll want to choose the highest lumen model available you can afford. We say that because the brightness of the projector directly increases the time window in which you can use it outside. To put this into perspective take a look at the simulation below to give you an idea of what different lumen values look like in the early evening. You can see that as the brightness increases, the movie is much easier to see and the colors are significantly more vibrant. Keep in mind however that this simulation takes place in the early evening when there is still quite a bit of ambient light around. As the night progresses all of the projectors will continue to get brighter as the outside light fades. 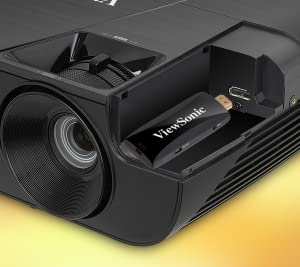 As a reference point, our top pick the ViewSonic PJD7720HD is a 3,2000 lumen projector. Right around the 3,000 lumen range is the sweet spot when it comes to price for performance. Anything less will lead to a cheaper projector, but as you can see from the comparison above the image quality will suffer. On the other end of the spectrum, the 4000+ lumen projectors get extremely expensive depending on how high you want to go. Many top of the line 6000 lumen projectors will retail for $1,500 and up, not something we think most people would be willing to buy, at least not right away. However if your looking for something that packs more of a punch than the ViewSonic but is not terribly high priced, you should consider our upgrade pick, the Optoma EH500 which comes with a massive 4,700 lumen bulb for enhanced brightness and usability. Let go ahead and get into a bit more detail about how projectors fair at different times of day. We’ll start out with a comparison chart so you can see the difference between various bulbs in varying hours of the day and get a good idea of what you can expect in a real life scenario. As you can see from above, each 1,000 lumens gives you around an additional hour of use out of your projector in a given night. A 2,000 lumen projector at 9 pm might look that same as a 4000 model at 7 pm meaning you’ll have an additional two hours in which you can use the brighter projector. Not to mention that at 9 pm the 4,000 lumen model would rival a movie theater so long as it wasn’t 30′ away from the screen. (we’ll talk about that in the projection size section). This is why we recommend that when looking for the best outdoor projector, you choose one with the highest lumen value you can get away with so long as it is still has a high enough resolution and isn’t astronomically priced. If your looking for a budget outdoor project we’d still recommend at least 2,000 lumens, anything below that and you’d risk having to wait too far into the evening before being able to watch anything on the screen. Our top recommendation is still the ViewSonic PJD7720HD as it is an excellent blend of high brightness and low cost that makes it ideal for any backyard. Another key factor that can affect the clarity and overall enjoyment of your projector is its output resolution. Simply put this is how many pixels the projector can display in a given area. More pixels will give you a sharper imaged, while fewer will produce a softer, less clear picture. For any outdoor projector you’ll want a minimum of 720p resolution, but all of our recommendations come with native 1080p output. We chose them because when your viewing a 120″ or above projection image anything less and the image will looked blurry and slightly out of focus. Below you can see a visual comparison of the various standard resolutions that are available. There are also less common resolutions available between and above the ones listed. You’ll notice that we omitted 4k from comparison and there is a very good reason for it. At the current time there are no cost effective options for outdoor 4k projectors for homeowners. While it is possible to get cinema class projectors, those will run you in the tens of thousands of dollars and simply aren’t worth if it you just want to watch some sports or enjoy a good movie. Plus many of the 4k projectors available are on the low end when it comes to lumens as they are supposed to be used in totally dark media rooms for maximum brightness. If your dead set that you want 4k you can pick up the Sony VPLVW365ES which outputs native 4k content, but it comes at the the expense of brightness, with only 1,500 lumens you would only want to use it later in the evening. Plus it costs quite a hefty chunk of change. Another way to think about resolution is that it measures how close you can sit to a screen and not see any individual pixels. If you have a 720p projector you would need to sit much farther back, lets say around 15 feet to get a smooth image. Where as with a 1080p outdoor projector you could sit at around 10 feet and have the same image clarity. Below is a representation of the approximate size difference between various standard resolutions as well as aspect ratios. You can see from the above chart that 1080p is far and away the best when it comes to high quality images and provides a far great pixel density when viewed at the same image size of a 720p projector. This allows for enhanced clarity, less blurring and an overall greater viewing experience. When it comes to aspect ratio the best outdoor projectors will be either 16:9 or 16:10 which are both cinematic ratios, perfect for sports and movies. 4:3 is a bit on an older aspect ratio which is rarely used nowadays, but if you do happen to spot a 4:3 projector we’d recommend passing on it as you’ll have trouble finding screens that match the size perfectly. All of our recommend outdoor projectors, including our top choice the ViewSonic PJD7720HD, have native HD 1080p output and with the exception of the Epson EX9200, have a 16:9 aspect ratio. We stress the importance of having a projector that outputs native 1080p content because many lower quality offerings will be able to upscale 720p content or can have 1080p inputs but not display them at full resolution. You can see from the image above that while the up-scaled content is the same size as the native content it is far less clear. Having a native 1080p HD projector will ensure that you get the best possible image quality outdoors and future proof your outdoor projector investment. If your looking for the best outdoor projector you’re probably hoping to get something that will project a screen that is suitably large enough to see, even if your far away breaking in your new football gloves before the big game. The good thing with all projectors is that as they are moved closer to or farther away from the screen the overall image size changes as well. This statistic is known as the throw ratio and can vary greatly between various projectors. The basic setup of a projector is shown below, we will use this to explain what the best projection size and throw ratio is. Just like with TV’s projector screen sizes are measured at a 45 degree angle from the bottom left of the image to the top right. Projectors also have a set distance that they are able to focus at, usually between 8′ and 30′ for most outdoor projectors. The throw ratio is those two numbers divided by each other. Lets use our top pick the ViewSonic PJD7720HD as an example. It has a variable throw ratio of 1.49~1.64 depending on the calibration. This mean that for each 1.49 feet away from the screen it will display a 12″ screen. Because each projector has a slightly different lens you will always have a bit of variability in this measurement. But with the advanced built-in image adjustment features it’s easy to correct any irregularities. One of the main things you might see is a slightly tilted image at greater distances which can be quickly fixed by altering the Keystoning setting. 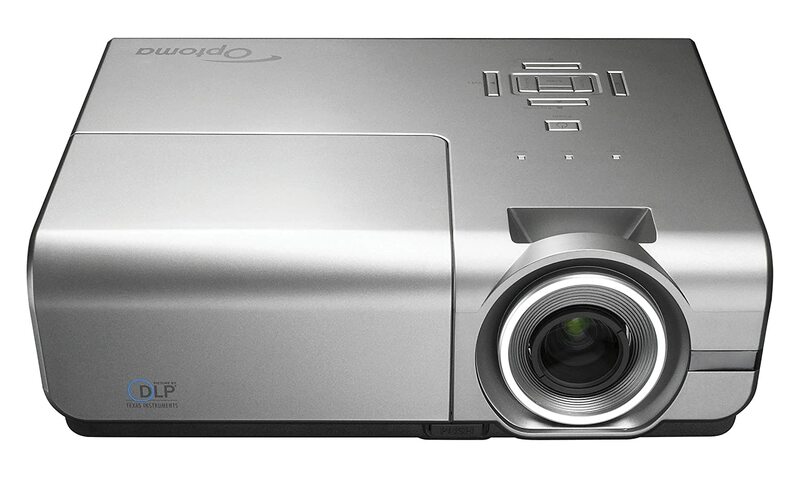 There are also another class of projectors known as short throw projectors which have extremely low throw ratios, around 0.5 or less, meaning that they can be extremely close and still provide a large image. Typically these are not ideal for outdoor settings due to the seating arrangement and lack of ceiling mounts, however if you get one that can be ground mounted they do make for a perfectly acceptable replacement. These type of projectors are mounted very close to the screen, usually directly above it and project nearly straight down, and are not something that can be easily set up and taken down in an evening. When it comes to outdoor projectors, or really any projector for that matter, one of their main drawback when compared to TV’s is the need for new lamps after the originals burn out. Similar to a household light bulb, after so many hours of use the filament inside will simply burn up and need to be replaced. A good rule of thumb is the replacement lamps will be between 10-40% of the value of the projector, so they are not exactly cheap to replace. This is one of many reasons we chose the ViewSonic PJD7720HD as our top choice, it has a 10,000 hour bulb, meaning you can watch 10 hours of programming every week of the year and use the same bulb for 17 years. Many of the higher lumen projectors like our high-end pick, the Optoma EH500 have much shorter lamp lives. One of the critical factor that determines lamp life is heat damage. The higher power a projector is and the more lumens it outputs the greater the damage will be on the bulb. The Optoma for example has 4,700 lumens but only a 3,500 hour lamp, meaning it will need to be replaced three times faster than the ViewSonic PJD7720HD. Even with the shorter replacement time you can still get a lot of entertainment out of this projector before needing to swap out the bulb. Modern day projectors come with a wide variety of available inputs, outputs and maintenance ports to choose from. If your looking for an easy answer as to which is best, go with an outdoor projector that has an HDMI port. Also known as High-Definition Multimedia Interface ports, they are able to not only transfer video, but can also send very high quality audio down the same cable for enhanced usability and an easier setup. You’ll be looking for an HDMI 1.4 or higher for the best performance as these are some of the most recent revisions and have the latest features for superior video and audio transfer. With an HDMI port, like the one found on all our top picks, as well as the Epson EX9200 shown below, you can get upwards of 6 Gbit/s per channel or up to 18 Gbit/s max. What that means for you average movie watcher is buttery smooth video, no lag, and absolutely zero video artifacts to ruin your immersion. You’ll also want to be on the look out for analog audio ports if you have an audio system capable of using them, many people still prefer the sound of analog versus digital audio. At OutdoorManCave we’d always choose digital however as, to us, it sounds smoother and is much less of a hassle to setup. While a great port to have, an RJ45 port, more commonly known as an ethernet or internet jack is really not needed on an outdoor projector as you’ll most likely not have an internet line nearby. Instead you’ll want a projector with wireless capabilities.. This allows you to connect your projector to the internet for streaming even when sitting outside. Other common ports include, VGA inputs so you can run the projector off older computers and laptops, S-video interfaces for older 480p content and various USB Type A and C ports for wireless dongles, maintenance and accessories. Overall just get a projector that has an HDMI port and save yourself a lot of trouble in the long run, plus you’ll be quickly up an running after receiving your projector and you won’t have to fiddle around with a thousand long cables. Another sticking point with even the best outdoor projector is the built in speakers. Simply put, your buying a video unit and the audio is usually an afterthought. Typically the best you’ll get on an outdoor projector are two, 10W stereo speakers, and even those will hardly do such an amazing picture justice. Some of the lower quality projectors won’t even have built-in speakers or will instead ship with 3W varieties that sounds pale in comparison to more traditional home speakers. While we do suggest you try out the built in speakers of your projector first before purchasing additional outdoor speakers. You have a lot of options available if you decide to upgrade. 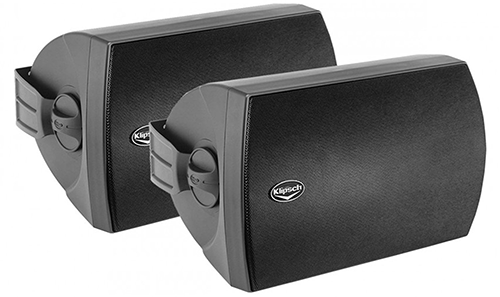 If your going for a built in outdoor theater you’ll want some hardwired speakers such as the Klipsch AS-650 Indoor/Outdoor Speakers. These will provide superior audio in every sense of the word. Plus they are in a UV resistant enclosure and have a rustproof housing to ensure they can stand up the the elements. If your looking for a bit more portable option that requires less wiring, you may want to instead opt for a Bluetooth speaker system that you can connect to your streaming device, thus bypassing the built-in projector speakers. A great choice for these, and something that blends in with the surroundings would be the Bluetooth Outdoor Rock Speakers. This pair of 40W speakers will immediately immerse you in the big game or movie of choice without the distraction and hassle of running wires and long set up times. Overall just keep in mind that your buying a projector and not a speaker system, expect great video, but standard audio and you won’t be disappointed. If your looking for awesome audio to go along with your movies you’ll need to grab a set or sets of external speakers to deck out your outdoor entertainment system. The best outdoor projector will come loaded with various features that enhance its capabilities and make it easier for you to enjoy. One of the most well known among them is 3D capabilities. With the prevalence of 3D movies and feature films some people will want to experience the same thrill in their own backyards. Just keep in mind that if you get a modern day 3D outdoor projector you’ll need to pick up a matching pair of active 3D glasses to go along with it. Something else that we think if far more important that 3D, is wireless streaming or the ability to plug in a streaming device directly into your projector. If you looking for the best outdoor projector, it needs to have this feature, we find that we use it all the time and its a real lifesaver if you need to quickly play something on the big screen. Our top pick the ViewSonic PJD7720HD actually has a Discreet Wireless Streaming PortAll which allow you to plug in an HDMI/MHL streaming stick or an optional wireless dongle to open up a world of possibilities when it comes to outdoor media. Warranty is also a big concern when it comes to projectors, particularly because they are fairly expensive purchases and, being electronic, a bit more prone to failures than a grill or fire pit. Most projectors come with some sort of warranty, a standard offering would be 3 year limited warranty on the body and parts and a 1 year warranty on the lamp (bulb) itself. This is because the bulb is the single critical component that makes the projector function and is fairly delicate. If your looking at a projector that has a 6 month or less warranty I’d question whether that is the best choice, 6 months is hardly long enough to accurately gauge a $500 piece of technology that is supposed to last for years. Last up on the additional features to be concerned with is the dB (sound) rating of the projector. Most mid to high end projectors ship with ultra quite fans and large vents to ensure they remain cool and quite during use, nobody wants a buzzing fan to ruin their movie. If you see some of the smaller options, they sacrifice vents and fans in return for enhanced portability. 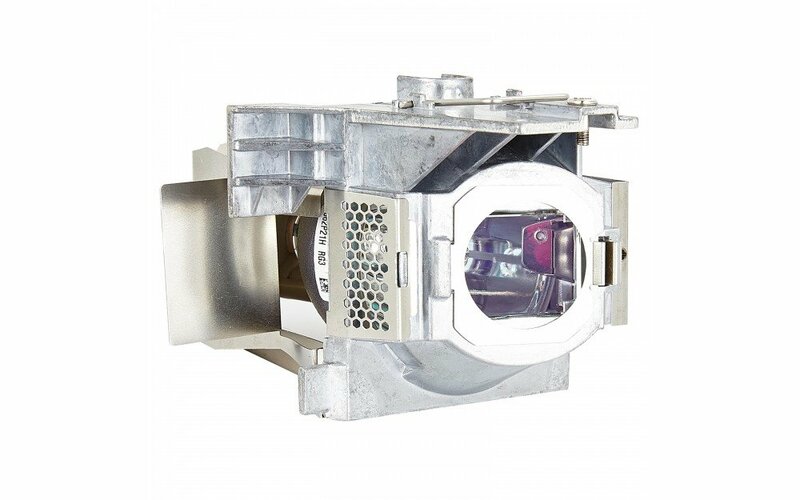 If your looking to get the maximum life span out of your new projector opt for something that has multiple, very low dB fans that can adequately cool the unit even under consistent video load such as watching a football game or movie. 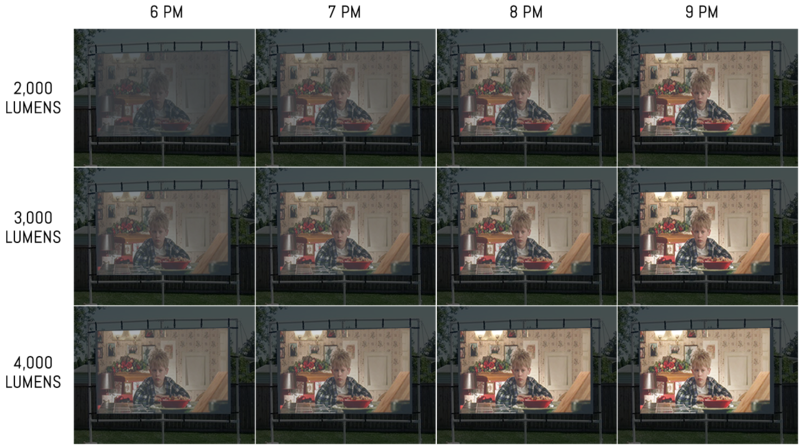 The cost of outdoor projector can vary just as much as the landscape around you. However there are a few rules of thumb when it comes to determining if you’re getting a good deal or not. If you’re looking for a 1080p and up projector with a minimum of 2,000 lumens of power you should expect to be paying right around $500-$700. If instead your opting for a budget 720p option of the same lumens you’ll be spending around $300-400. Once you start including extras like 3D capabilities, wireless streaming and long life bulbs that price can inflate by around an additional $100 or so. For absolution top of the line 1080p and 4,000+ lumen projectors you’re rock bottom price will be around $1,000, with outdoor projectors you really are paying for performance. If you happen to see a projector that strays a bit far from these guidelines either one way or the other you can be sure it is either a chopped down version on the cheap side with “up-scaling resolution” or on the flip side has some sort of gimmicky feature that claims to enhance performance. Don’t get us wrong though for the $2,500 and up projectors you’ll get a lot of features that are great such as HDR video and multi streaming inputs. Whichever projector you end up choosing just use a bit of common sense and the above guidelines to make sure your getting the best outdoor projector for the money. The good thing about outdoor projectors is they require very little maintenance on a day to day basis. We would recommend that every few months you go ahead and use some compressed air to blow the dust out of the vents to prevent buildups that reduce internal air flow. You’ll also want to make sure the lens is very clean before use, a bit of alcohol and a microfiber cloth work perfect to clean it of any dust and debris. Another thing you’ll want to check is any internal dust filters. Some of the larger outdoor projectors will have these installed near the vents to stop unwanted dust from entering. They usually slide right out and can be dusted off using compressed air. The last thing that needs to be done very infrequently, as we talk about earlier, is replace the bulb once it burns out. This is typically a simple operation the involves removing a couple of screws, popping out the old bulb, inserting the new one and closing the unit back up. Some people opt to purchase a replacement bulb with the initial order, but we think it’s better to wait. Who knows what could happen in the 10 years before you need to replace it, heck we wouldn’t even know where we put the replacement bulb in the first place. One of the great things about outdoor projectors is that you can have as many or as few accessories as you want. There are a few though that are a much better in terms of enjoying an evening movie under the stars. The first of which, and arguable most important accessory is an outdoor projector screen. Next up on the nice-to-have accessories list is an outdoor projector stand. This gives your projector a solid stable place to sit while its in use. 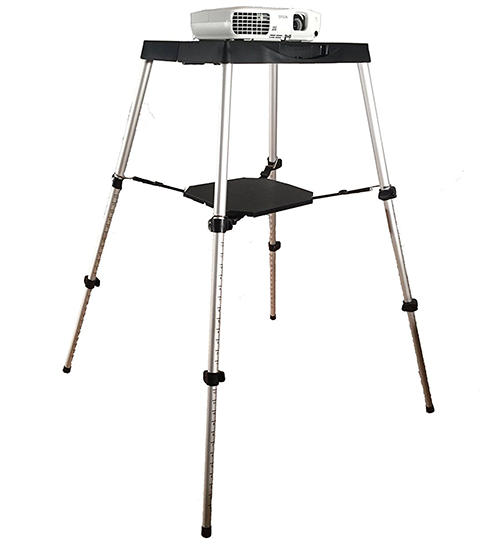 Although it’s quite possible to balance your projector on Uncle Bob’s beer cooler we’d recommend you get something a little more purpose built such as the Visual Apex Portable Projector Table Stand. This handy stand completely disassembles and fits into a tiny bag for quick storage. Plus it is adjustable from 18.5″ to 44″ high giving you enough height to project on even the largest of screens. not only that, but each leg can be individually adjusted to compensate for uneven ground surfaces. Overall it is a great piece of kit that goes a long way to enhancing your outdoor projector experience. Rounding out our accessories list is a pair, or multiple pairs of outdoor projector speakers. Unfortunately most outdoor or indoor projectors have very low quality speakers due to their design. If you want the best outdoor projector audio you’ll need to invest in a great set of speakers. 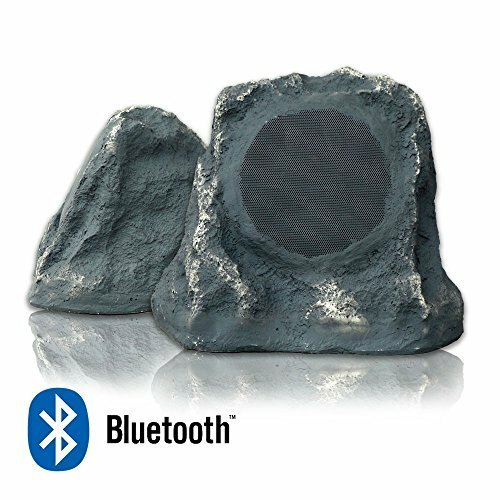 Most people should opt for the easier to set up and more portable Bluetooth options such as the above Bluetooth Outdoor Rock Speakers. They provide great sound, can easily be moved around and require almost no work to get set up. On the other hand if you’re planning on building a permanent outdoor entertainment space you’ll want something a bit more robust such as the Klipsch AS-650 Indoor/Outdoor Speakers with provide incredible hardwired audio that will rival even the best home entertainment speakers. Plus because they are from a great brand and you know you’ll be getting quality products, a great warranty and speakers that sound down right amazing. While we would still recommend one of our top 3 best outdoor projectors that were reviewed at the beginning of the article, below are a few alternative choices if you’re looking for something a bit different. Whether it’s a specific lumen value, resolution or price we’ll give you a lot more options to choose from. The Epson PowerLite Home Cinema 2030 is a spectacular full 1080p HD, 2,000 lumen projector that runs on the newest 3LCD technology which boosts its brightness and color vibrancy without the need for enhanced power requirements. With full HDMI connectivity and 3D compatibility you’ll have one of the best outdoor projectors available. Plus with the built in speaker you’ll have everything you need in one convenient package. Not to mention the Epson PowerLite can produce images up to 300″ diagonally which’s makes for stunning movies in near theater like sizes. In addition, this indoor / outdoor projector has full MHL compatibility making it easy to stream movies, videos and games from any MHL enabled device. With so many features and an incredible image it’s hard to beat the Epson PowerLite Home Cinema 2030 when it comes to the newest technological advancements making it a great choice for an outdoor projector. The Epson Home Cinema 1040 is a a bit newer model of the Home Cinema 2030 and packs a brighter bulb at the expense of more energy costs and higher internal temperatures. It does have quite a few features to make up for the cost however with a full 1080p native resolution, 10,000 hour blub life in Eco mode plus digital HDMI connections. Not to mention it has the same great 3LCD technology found in all high end Epson projectors that allow it to display a much brighter image with a lower lumen value. The Epson Home Cinema 1040 also comes with easy to use optimized color modes so you can quickly swap the settings to ensure you have the best picture for any situation. With 3,000 lumens this would be a perfect outdoor projector in the mid tier price range and with the wealth of ports and features it makes for a great all around purchase. 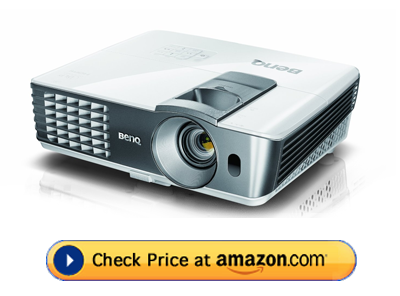 The BenQ W1070 is a another solid choice for an outdoor projector with a respectable 2,000 lumens of power, full 1080p resolution and a SmartEco mode to reduce power consumption. With two Full HDMI inputs you’ll be able to stream media from multiple sources on the fly and with the built-in speakers can enjoy crisp, clear sound on the go. Plus with 3D support for multiple media types you can enjoy the latest technological innovations in the comfort of your own backyard. Built using Colorific technology you’ll easily be able to switch between day and night modes as the stars come out to get that perfect picture. Setup is also extremely easy with this plug in play projector unit, no messing with settings, menus or wiring a hundred cables to get it up and running. 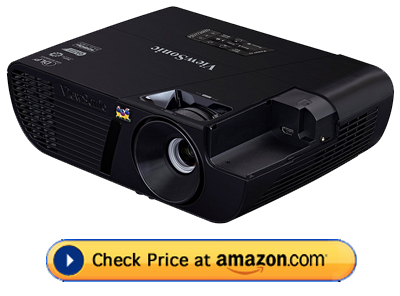 If your looking for a great outdoor projector this would make for a excellent choice. With 3,000 lumens of full HD content and a 23,000:1 contrast ratio you’ll feel right in the middle of the action. With incredibly dark blacks and crystal clear white, the Optoma HD142X produces very high quality images and with the aforementioned 3,000 lumens it has enough power to project well before the sun sets. Another great feature is the included back lit remote, which is perfect for making sure you can see which buttons your pushing in the dead of night. With the simple adjustments it’s very easy to get the picture size to match any size and orientation, perfect for uneven or tilted ground. As will all of our top picks it comes standard with an HDMI port for digital video and audio streaming. Whats even better is you’re getting all of the above features at a great price point, this is a high quality and very affordable outdoor projector. It’s perfect if your hunting for something that just works. 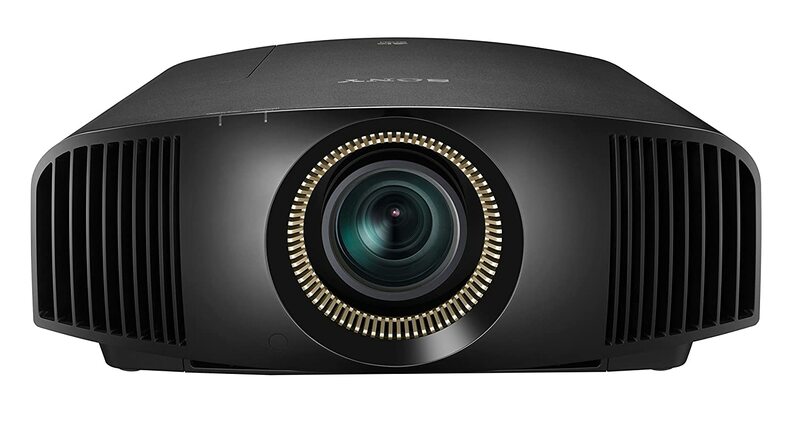 When it comes to high-end, high power projectors the Epson Home Cinema 1440 is right at the top of the list, with a massive 4,400 lumen output and a 10,000:1 contrast ratio you’ll have an incredibly bright image in even non-ideal conditions. As with most high end projectors you’ll be paying a bit of a premium for the extra power and sacrificing extended bulb life. 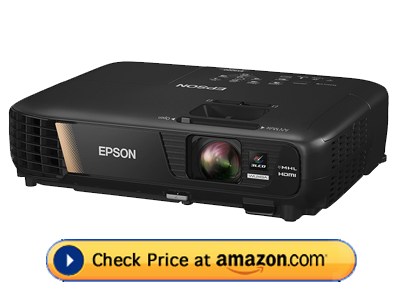 On average you can expect to get right around 4,000 hours out of a single bulb for the Epson 1440. However if your looking for one of the brightest and best outdoor projectors this is the ticket. With full MHL embedded technology and multiple HDMI ports you’ll have ample options when it comes to playing content. Plus with a whopping 300″ screen at 30 feet you’ll be able to host even large parties and have the image size to back it up. Not to mention it produces brilliant colors due to the built in LCD technology and is perfect for viewing Blu-Rays and watching HD content. Overall there is a lot that goes into choosing an outdoor projector, from resolution, lumens, HDMI ports and more. We hope we’ve been able to get you started or take you past the finish line on your quest for the best outdoor projector. You’ll now know what to look for, what to avoid and a few of the recommended accessories to pick up for your epic outdoor man cave. If you still a bit undecided on which is best we continue to recommend that you go with the ViewSonic PJD7720HD. It is an incredible value and produces amazing video. With its 1080p resolution, 10,000 hour lamp and 3,200 lumens it is an awesome piece of technology that is very reasonably priced.